Tue, Oct 16, 2018, 07:18 pm SL Time, ColomboPage News Desk, Sri Lanka. Oct 16, Colombo: The Sri Lanka Foreign Policy and Economic Diplomacy Dialogue, organized by the Ministry of Foreign Affairs, commenced on Monday ( 15 October) with the participation of mid-career diplomats from 23 countries from Asia, Africa, the Middle East, Latin America, and Australasia. The two week long program is held as part of the Economic Diplomacy Program (EDP) of the Foreign Ministry and will primarily focus on Sri Lanka's Economy with special emphasis on its emergence as a 'Hub of the Indian Ocean' and as a trade, investment, and tourist destination, while showcasing Sri Lanka's international brands, entrepreneurship, as well as important strides in research and innovation. It will also explore Sri Lanka's rich history and culture, aspects of foreign policy including positions on international politics, and thematic issues - good governance, sustainable development, and right to information, social media and cyber security. Sri Lanka's key government officials, academics, scientists, and business leaders will participate in the discussions, and a 3- day field visit will follow. At the commencement of the session, the participants called on Foreign Minister Tilak Marapana, who welcomed them and wished them a productive and enjoyable stay in Sri Lanka. 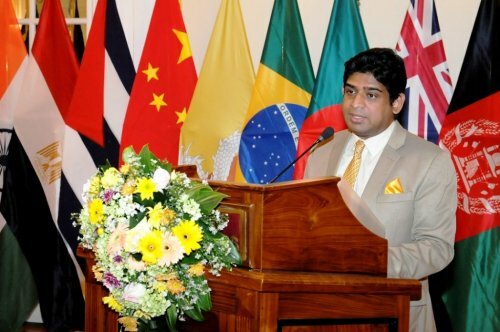 State Minister of Foreign Affairs Vasantha Senanayake who inaugurated the Dialogue, said Sri Lanka has always been a melting pot of diverse cultures and ethnicities as well as different religions, and its strategic geographical location has made it a unique international player since ancient times. Outlining the trajectory of Sri Lanka's foreign relations and the challenges the country has faced through history, he said Sri Lanka was well positioned to be a knowledge center for international relations. In their interactions with each other and their Sri Lankan counterparts, he encouraged the visiting diplomats to be forward looking and to collectively seek to anticipate future trends and how to deal with them, in the region and the world. Acting Foreign Secretary Ravinatha Aryasinha addressing the diplomats said their presence was a reflection of the importance their respective Governments placed on relations with Sri Lanka. He expressed confidence that through this Dialogue Sri Lanka will not only be informing them about how the country is straddling the many politico- economic and social challenges of our times, but that in turn would also be informed of the perspectives their respective countries and regions have on each of these subjects. He said their remaining engaged with Sri Lanka - both professionally and personally, would be a tremendous support to the efforts by Sri Lanka's respective Missions in or accredited to their capitals, as they seek to strengthen bilateral relations between the countries. Under the EDP, having analyzed patterns of recent economic flows and the potential within each target market, the Foreign Ministry has set specific performance targets to be accomplished on exports, investment, tourism and foreign employment for each Mission. Also in collaboration with the relevant line Ministries and the private sector, ten Sri Lanka Missions abroad in emerging markets are being supported in carrying out targeted campaigns that would enhance Sri Lanka's global footprint and bring tangible economic benefits to Sri Lanka. Programs are being initiated to promote ICT products and services and also organic food products in Sweden, apparel, textile & footwear in South Africa, fresh and processed food in Bahrain, Gems and Jewellery in Turkey, spices and apparel in Brazil, wellness tourism in the UAE, inward investment from the Republic of Korea and Japan, and outward investment in Myanmar and Nepal. State Secretary of the Ministry of Foreign Affairs Grace Asirwatham and Additional Secretary/Bilateral Affairs Sumith Nakandala were associated at the inaugural session. The program is being conducted in collaboration with the Bandaranaike International Diplomatic Training Institute (BIDTI) and the Lakshman Kadirgamar Institute (LKI). The LKI's Executive Director Dr. Ganeshan Wignaraja delivered the inaugural lecture on 'The evolving Asian Economic Outlook and implications for Sri Lanka', while the Director General of the BIDTI Pamela J. Deen and the Foreign Ministry's Director/ International & Technical Cooperation Kapila Fonseka also addressed the participants. Diplomats from Afghanistan, Australia, Bangladesh, Bhutan, Brazil, China, Cuba, Egypt, India, Kenya, Malaysia, Maldives, Mongolia, Myanmar, Nepal, Pakistan, Palestine, Senegal, Singapore, South Africa, Thailand, United Arab Emirates and Vietnam, are attending these sessions.